Caltex Circular Logo Stickers. 3", 4" or 6" Pair. Caltex Naked Girl Pin Up Lady Sticker. 3.5". Caltex Petrolania Petrol Pump Sticker. 8.5", 9" or 12". Caltex Red, Black & Beige Stickers. 3" Pair. 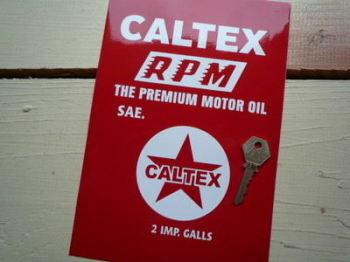 Caltex RPM Oil Can Cut Vinyl Sticker. 8". Caltex Skull Glasses Stickers. 3" Pair.